GRACE FLORA (DALE) COWLES was born the fourth child to SAMUEL A. and JULIA ANN BLAKESLEY DALE on Sept. 28, 1887 at their farm home northeast of Pleasanton, Iowa and died March 30, 1985 at Westview Acres in Leon, Iowa, age 97 years, 6 months and 2 days. She grew to womanhood on the family farm and received her schooling at the Boothtown County School. In December 1902, she was baptized in the icy waters of Little River, becoming a member of the New Salem Baptist Church of which she has been a faithful member for 82 years. On July 25, 1909 she was united in marriage to CLIFFORD CORYDON COWLES by Pastor CYRUS DEYOE. To this union for children were born. 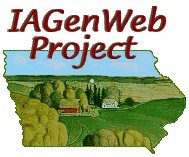 Their home was on the family farm east of Davis City, Iowa until they retired and moved to Leon, Iowa. For 18 months GRACIE and CLIFFORD have resided at Westview Acres Care Center. On July 25, 1984, they celebrated 75 years of married life together. GRACIE was preceded in death by her parents; six brothers; three sisters; and an infant daughter, who died at birth. Survivors include her husband CLIFFORD of Westview Acres; son, DALE and wife LAVERA COWLES, Leon, Iowa; daughters: VERA and her husband, OTIS VANDEL, Leon, Iowa and VERNA and husband RAY MCKEEMAN, Gering, Ne. ; grandchildren; MARVEL PAYTON and husband, LYNN, Leon; VICKI BENZ and husband, DUANE, Arkansas City, Ks. : JERRY MCKEEMAN, San Francisco, Ca. ; great grandchildren: TIME PAYTON, in the U. S. Navy and stationed at Alameda, Ca., TRACI BENZ, Arkansas City; sister, BLADA WAFFLE, Westview Acres; three sisters-in-law CLARICE WARRIOR, Afton, Iowa MINNIE LEEPER and MINNIE DALE both of Leon; nieces, nephews cousins and friends.